I decided to purchase the book, a collection of academic essays on the use of magico-religious tenets by who we come to see are violent non-state actors (VNSAs). I am not sure why you featured the book here in the blog. It is nothing but hurtful to Santa Muerte, and is just about the most unreedemingly white, anglo, american-centric and all-around hurtful approach to examining the topic of Santa Muerte. Dr. Bob Bunker makes a living studying these things for the FBI and other governmental and non-governmental anti-terror foundations, and I should have known before I spent my money how this was going to turn out. Like any religion, cult, group/mass of people, or belief system, there is a WIDE spectrum. This book chooses to expose ONLY individuals who are violently and sickeningly acting out in disturbing ways in the perceived “name” of a religion – (i.e, Islam; Santa Muerte; Palo Mayombe) which is, truly, simply window dressing for cultural and religious-based violence. This book lumps santa muerte in with sub-saharan African magical practices such as killing children for certain body parts and Islamist Jihadism. What a waste. It wasn’t eye-opening. It only cemented my thought that ANYthing can be abused, misunderstood and misconstrued in this world. See, and I thought this blog and website was a place of respect for La Madrina. I guess I was very wrong. It is quite a difficult book Andrew – and I would agree that it needs to be understood within it’s context. However, I wouldn’t say that this context is demonizing Santa Muerte, or any other devotional tradition. It is important to note the inclusion of strong supporters of traditional and alternative/new religions like Tony Kail, who has done so much to support African traditional religions in the U.S. and in Africa – as well as combat false associations of criminality with misunderstood (in the context of U.S. mainstream media/anglo-centric cultural standards) devotional traditions. As Robert Bunker points out in his introduction to the work – this is very new territory, and this book is somewhat experimental in being able to present analysis of this harrowing and obfuscated topic. I have to admit, having had extensive contact and friendships with Santa Muerte devotees in Latin America – so many of whom are VERY concerned with the cartel, narco-cultura and dark-magico religious elements – it has begun to look to me as if the denial of these elements is just another form of white washing. 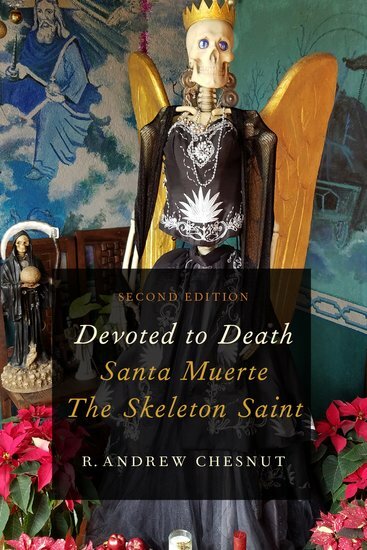 The book that I read did not equate Santa Muerte as a whole with violence – it focuses on a criminal sub-set of the devotional tradition. One which Bunker has detailed as a small, but growing sub-set in his analytical work – and which Andrew Chesnut has also examined in his work – one which I have personally encountered in rural Georgia. It may be without a background in intelligence analysis that the nuances get obscured – I’ve been so immersed in this topic that perhaps I’m making assumptions about people’s understanding of the context that need further clarification. The Santa Muerte that you see in the U.S. is NOT the Santa Muerte that people know in Mexico – criminal or not – and it is absolutely not the Santa Muerte that the cartels and narco-cultura pay homage to, especially those that follow the path of people like Adolfo Constanzo. Andrew and I both celebrate the diversity of Santa Muerte’s tradition – and our relationships with people like Hank Vine, Arley Vasquez, Enriqueta Vargas, Dona Queta, Martin George, Michael Caleigh – and so many other devotees should show that we are not seeking to disrespect la Nina. As scholars and research analysts, however, we would be dishonest if we did not present the entire picture – and unfortunately with Santa Muerte an element of that picture is very dark. Thank you for bringing this up – I know that many have read this and silently gone away with the same opinion. It’s helpful to discuss these issues with candor and openness – without understanding the full spectrum of Santa Muerte it’s not possible to correct and combat the scare mongering and bigoted media coverage that we are all concerned with. All of us including Robert Bunker and the other analysts that are dedicating themselves to trying to understand the spread of violence in our interconnected and globalized culture.